Reagan, in 1961, says that "Government has invaded the free precincts of private citizens," stating that the U.S. government owns "1/5th of the total industrial capacity of the United States." Reagan says "One of the traditional methods of imposing statism or socialism on a people has been by way of medicine. It’s very easy to disguise a medical program as a humanitarian project, most people are a little reluctant to oppose anything that suggests medical care for people who possibly can’t afford it." 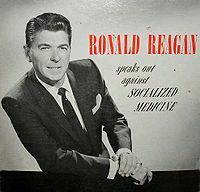 Reagan cites the failure of president Harry Truman’s national health insurance proposal as evidence of the American people's rejection of socialized medicine.